I bow to Vajra Dakini. For instance, consider space: what depends on what? Likewise, mahamudra: it doesn’t depend on anything. Don’t control. Let go and rest naturally. Let what binds you let go and freedom is not in doubt. When you look into space, seeing stops. and you come to the deepest awakening. Whenever you see your mind, the clouds of thinking clear. Likewise, your mind, in essence, is beyond color or shape. It does not change because you do good or evil. You can’t say that space is “like this”. There is nothing there: you can’t say “it’s like this”. Vinaya, sutras or other collections. Ambition clouds sheer clarity and you don’t see it. Thinking about precepts undermines the point of commitment. Do not think about anything; let all ambition drop. Let what arises settle by itself, like patterns in water. Do not break this commitment: it is the light in the dark. This is called “The Light of the Teaching”. The foolish are not interested in this. The currents of samsara constantly carry them away. Oh, how pitiable, the foolish — their struggles never end. Don’t accept these struggles, long for freedom, and rely on a skilled teacher. When his (her) energy enters your heart, your mind is freed. Samsaric ways are senseless: they are the seeds of suffering. Conventional ways are pointless. Focus on what is sound and true. Majestic outlook is beyond all fixation. Majestic practice is no distraction. Majestic behavior is no action or effort. The fruition is there when you are free from hope and fear. Beyond any frame of reference mind is naturally clear. Where there is no path you begin the path of awakening. Where there is nothing to work on you come to the deepest awakening. Alas! Look carefully at this experience of the world. Nothing lasts. It’s like a dream, like magic. The dream, the magic, makes no sense. Experience this grief and forget the affairs of the world. Practice alone in forest or mountain retreats. When you come to nothing to come to, you come to mahamudra. A tree spreads its branches and leaves. Cut the root and ten thousand branches wither. Likewise, cut the root of mind and the leaves of samsara wither. A single light dispels it all. Dispels the ignorance, evil and confusion of a thousand eons. With the ways of the intellect you won’t see beyond intellect. With the ways of action you won’t know non-action. Cut your mind at its root and rest in naked awareness. Let the cloudy waters of thinking settle and clear. Let appearances come and go on their own. With nothing to change, the world you experience becomes mahamudra. patterns and distortions fall away. Rest in no beginning, with no self-interest or expectation. Let what appears appear on its own and let conceptual ways subside. The most majestic of outlooks is free of all reference. The most majestic of practices is vast and deep without limit. The most majestic of behaviors is open-minded and impartial. The most majestic of fruitions is natural being, free of concern. At first, practice is a river rushing through a gorge. In the middle, it’s the river Ganges, smooth and flowing. In the end, it’s where all rivers meet, mother and child. Work the essentials of energy and bring out the vitality of awareness. Train awareness until it does truly rest. When you practice with a sexual partner, empty bliss awareness arises. The balancing of method and wisdom transforms energy. Return it to its place, and let it saturate your body. When you are free from longing and desire, empty bliss awareness arises. You will have a long life, you will not gray, and you will shine like the moon. You will radiate health and well-being and be as strong as a lion. You will quickly attain the ordinary abilities and open to the supreme one. Abide in the hearts of all worthy beings. These are the great Tilopa’s oral instructions. 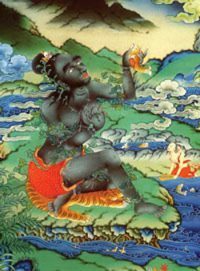 On the completion of the twelve hardships, Tilopa taught these on the banks of the river Ganges to the Kashmiri pandit, the wise and learned Naropa. 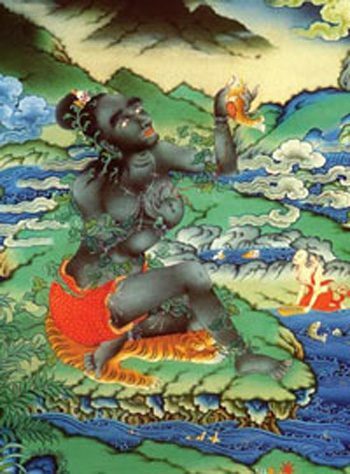 Naropa taught The Twenty-Eight Vajra Verses to the great interpreter, the king of translators, Marpa Chökyi Lodrö. Marpa finalized his translation at Pulahari in the north of India. Ken McLeod translated this into English in Los Angeles in the southwest of the United States, working from the efforts of previous translators and various commentaries.